The present bibliographical list follows a long-established tradition of bibliographical research and complements several previous achievements made from the early 18th century until to the present day. By way of introduction, I will firstly present here a short overview of the history of bibliographical research, focusing exclusively on early modern (17th- and 18th-century) anti-Christian polemical writings of Italian provenance in the Hebrew language. The first modern bibliographical description of Jewish literature, including some of the polemical compositions to be listed in our survey, was composed by Johann Christoph Wolf (1683-1739). 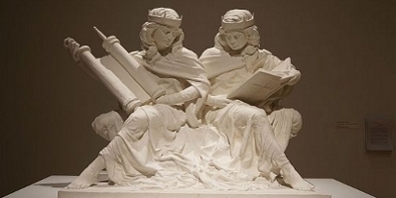 Wolf was a German Christian Hebraist, a theologian and an impassioned collector of books. 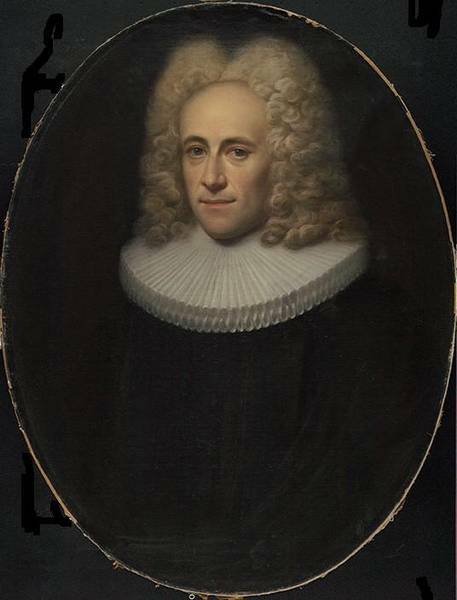 He devoted his life to a description of Jewish literature based, in large parts, on the well-known collection of manuscripts and printed materials collected by Rabbi David ben Abraham Oppenheimer (1664-1736), then housed in Hamburg. His research resulted in the four volumes of Bibliotheca Hebraea. It is worth noting that Wolf's volumes shaped the views Christian scholars held on Jewish literature and book lore for more than a century. At the end of the 18th century, a Christian Hebraist based in Parma named Giovanni Bernardo de Rossi took stock of all anti-Christian polemical compositions known to him at the time. The book he composed contains a list, along with short descriptions, of a total of 182 anti-Christian polemical writings. The majority of the items included in De Rossi's bibliography are of Italian provenance and seem to have originated in the early modern period. In the last decades of the 19th century and at the turn of the 20th, the great bibliographers of the 'Wissenschaft des Judentums' movement, Moritz Steinschneider, Marco Mortara, Adolph Neubauer, Georg Margoliouth, Hartwig Hirschfeld, Moise Schwab, Maximilian Weisz, Carlo Bernheimer, Alexander Marx, and Bernard Chapira, systematically surveyed the great Judaica collections of Europe's libraries and archives and published their more or less comprehensive catalogues of them. These bibliographical descriptions contain a great deal of indispensable information about the documents which concern us in the present essay. In 1935, the Danish scholar David Simonsen published a bibliographical overview on the polemical manuscripts preserved in the physical inheritance left by the late Prof. Adolph Posnanski (1854-1920), a recognized expert in anti-Christian Jewish polemical literature. After the Holocaust, the bibliographical research on Hebrew-language manuscripts continued with renewed interest and new catalogues were produced. In the 1960s, Ernst Róth and Leo Prijs published a bibliographical description of the manuscripts left intact in Germany's archives and libraries after the destruction during WWII. Basing his research on the works of his antecedents, most notably on De Rossi's catalogue,, Yehuda Rosenthal published in the early 1960s a comprehensive bibliographical sketch of Jewish polemical literature composed in the medieval as well as early modern periods. Rosenthal's list is still considered to be the most comprehensive bibliographical description of our subject matter despite the fact that there is much room for improvement with his bibliography. In 1977, Daniel J. Lasker published a monograph on Jewish Philosophical Polemics against Christianity in the Middle Age. His book, also a comprehensive discussion of this important topic, contains a lot of useful pieces of bibliographical information too. The book was republished in 2007 with an updated bibliographical supplement. The manuscript collection of the Collegio Rabbinico in Rome was reviewed in the 1980s and its catalogue published in 1990 by Ricardo di Segni. In 1991, Jay Rovner published the voluminous catalogue of the JTS, an essential collection of anti-Christian polemical manuscripts. In 2000, the bibliographical description of another important collection, that of the former Günzburg library, nowadays housed in the Russian State Library, Moscow, appeared in print. One year later, the catalogue of the Hebrew language manuscript collection housed in Parma library was compiled and edited by Benjamin Richler. Moreover, all the bibliographical descriptions mentioned previously were incorporated and made available in the online catalogue of the Institute of Microfilmed Hebrew Manuscripts of the National Library of Israel. In 1995, William Horbury published Samuel Krauss's comprehensive monograph on Jewish-Christian polemical encounters and their written documents. Horbury's edition not only corrects and supplements Krauss' original manuscript, left unfinished in the 1940s; but the bibliographical apparatus of the book has also been refreshed. Therefore, in its present form, Krauss' classic is not only an introduction to the study of Jewish polemical literature but may also serve as a valuable bibliographical tool. Besides the more comprehensive bibliographical descriptions mentioned so far, there are some important bibliographical references to the authors of the identifiable polemical manuscripts in our list, ones which cannot remain unmentioned in this context. In 1997, Meir Benayahu published two bibliographical sketches on R. Yehoshua ben Tzion Segré (1709-1798), a Rabbi of Scandiano and a relentless polemicist. Ten years later, in 2007, Asher Salah published a voluminous bibliographical description on 18th-century Italian intelligentsia entitled La République des lettres Rabbins, écrivains et médecins juifs en Italie au XVIIIe siecle. His book includes a great deal of valuable information on Italian authors who were also immersed in polemics. In autumn 2013, the scholarship of the Richard Plaschka Research Grant provided me with an opportunity to start some research, something which was apparently necessary to complement the shortcomings of previous bibliographies listed in this essay. The bibliographical research I commenced then has been conducted continuously since that time. The following list contains the present output of my many research stays at the Institute of Microfilmed Hebrew Manuscripts in Jerusalem. I readily recognise that my bibliographical list cannot be considered complete. Instead, it is a first tentative attempt to take stock of the precious bibliographical material on Jewish, anti-Christian treatises written in Italy during the 17th and 18th centuries. 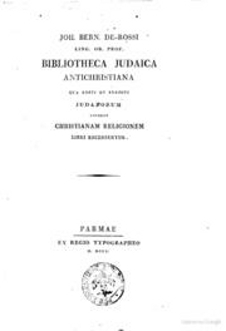 The following bibliography contains a list of all known 17th-18-century, anti-Christian polemical treatises of Italian provenance written in Hebrew. The list of the documents readily falls into two sections. 1. Section A lists all known identified texts and items are listed in order of the author's name. 2. Section B contains anonymous works. The anonymous items enumerated in section B are likely to have been of Italian origin and written in the 17th or 18th centuries. Treatises in subsection B are listed in alphabetical order.